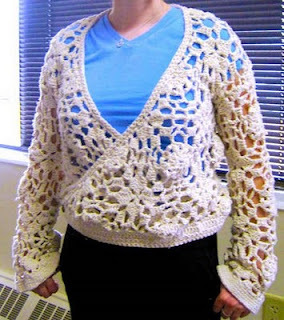 I got the pattern free from http://www.knittingdaily.com/media/p/27943.aspx and like crack dealers you can get even more awesomeness for $ once hooked on your first rock. I used the wrong sized crochet hook so it came out at first really big. I also couldn't quite join the granny squares like the pattern wanted in a way that I liked so I single crocheted them all around.